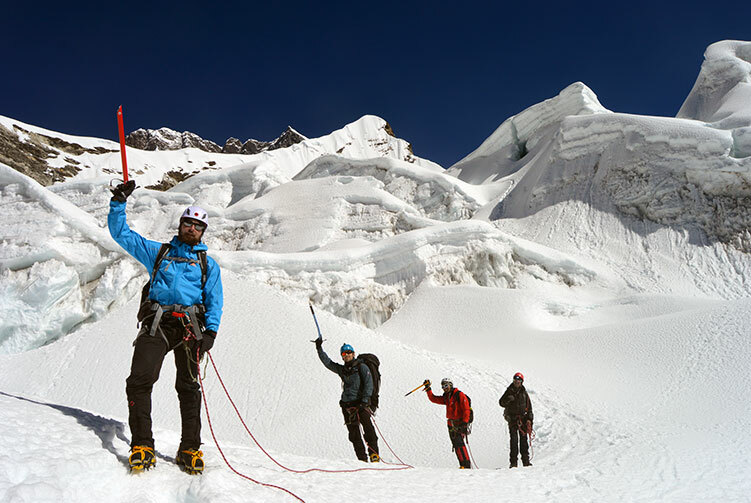 Ever dream of yourself being on top of two beautiful Himalayan peaks at a go? 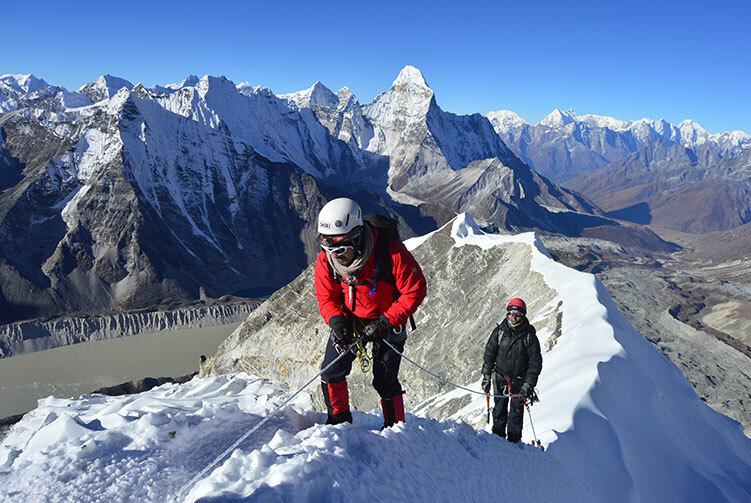 Your dream can be an incredible reality if you go on this wonderful adventure of climbing Mera Peak and Island Peak in the Khumbu region of the Himalaya. 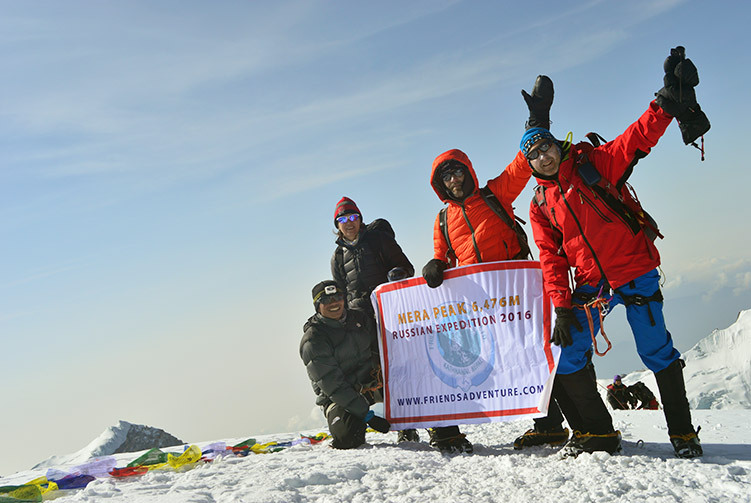 Mera Peak and Island Peak via Amphu Labtsa la pass is an adventure with wonderful combination of two trekking peaks climbing adventure. In between the two peaks climbing adventure, comes the technical Amphu Labtsa la pass that stands at the elevation of 5,845 meters above sea level. On the adventure, you have to indulge into multiple days of trekking too. After landing in Lukla in the Khumbu region, the trek goes towards Mera Peak to attempt its summit. During the trek you can explore beautiful Hinku valley. 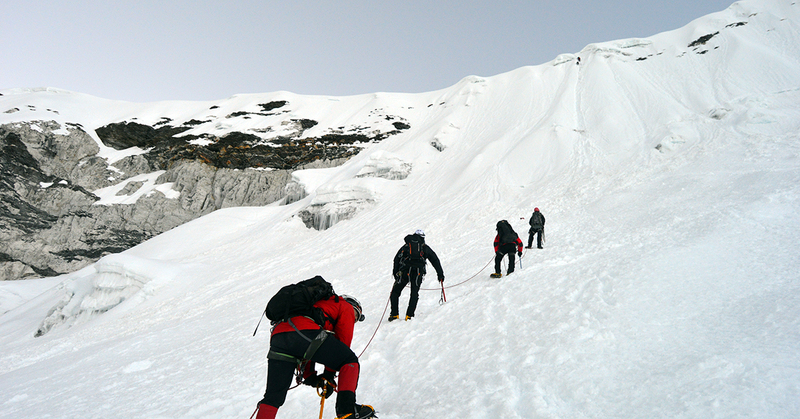 After climbing Mera Peak, it�s time to go over Amphu Labtsa la pass to go to Island Peak. Although it is just a pass to trek over, it is highly technical and adventurously thrilling. Later comes, another peak of the adventure, Island Peak. Once the climbing adventure is over, the returns back to meet Everest base camp trekking trail at Pangboche and returns back to Lukla via Tengboche and Namche. This trip is truly designed to satisfy the adventure hunger of adventurers. 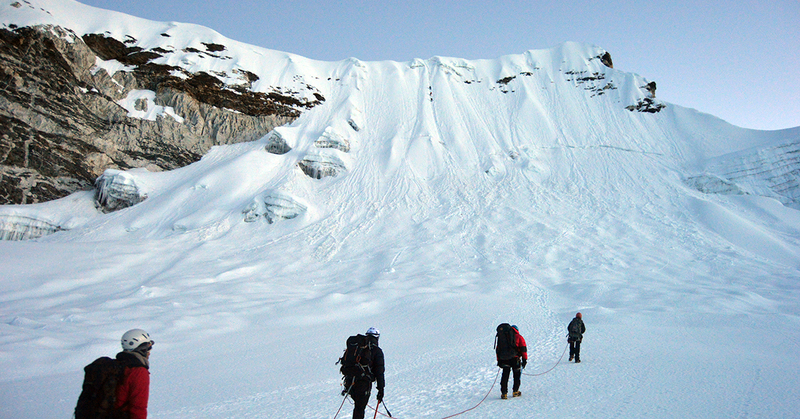 Although the adventure goes for several days, you do not need to be an expert mountaineer to go on the trip. You need to be good physical fitness with strong will power to push forward is highly needed though. We start trekking for the day to Thulo Odar in the remote area of Honku valley. We are moving forward towards remote and difficult part of the trip. First section of the walk goes down on the trail that is full of screes so a very balanced and careful walk down the trail is required. We set our camp at Thulo Odar in Upper Honku valley to spend our overnight today. We start the trek early morning after breakfast at the camp and start walking towards Panch Pokhari to stay overnight. Panch Pokhari literally translates as five ponds and we see those five sacred ponds where Hindu pilgrims make holy pilgrimage tour. Before reaching Panch Pokhari, we walk across the trail filled with glacial moraine. Once we reach Panch Pokhari at the elevation of 5,400 meters above sea level, we establish our camp and relax. It is the day to walk to Amphu Lapcha Base Camp today. Although a short distance walk, it brings spectacular views along the trail. Once we reach the base camp and set up our tents, we can laze around to explore more of the place. We spend the day here at the camp resting and preparing for the climb to cross Amphu Lapcha tomorrow. Our crew members will fix all the technical equipment necessary for the climbing this technical Amphu Lacha while we gather energy to do the adventure tomorrow. 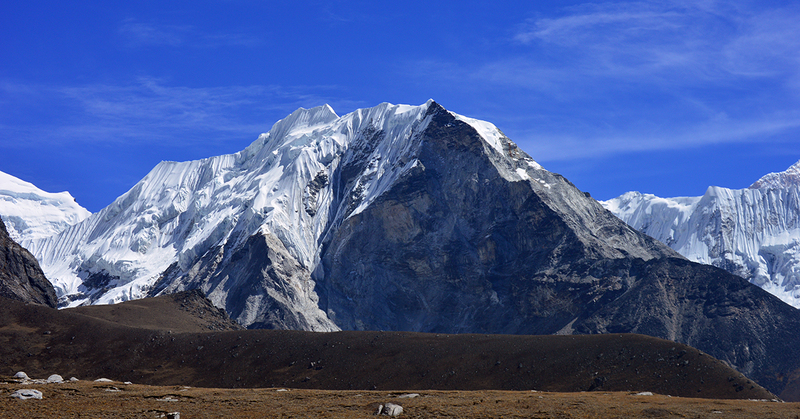 While resting at the base camp, we will enjoy some excellent views of Hinku Nup Glacier and Mingbo La. Today is an early start to cross the Amphu Lapcha pass at the elevation of 5,845 meters above sea level. 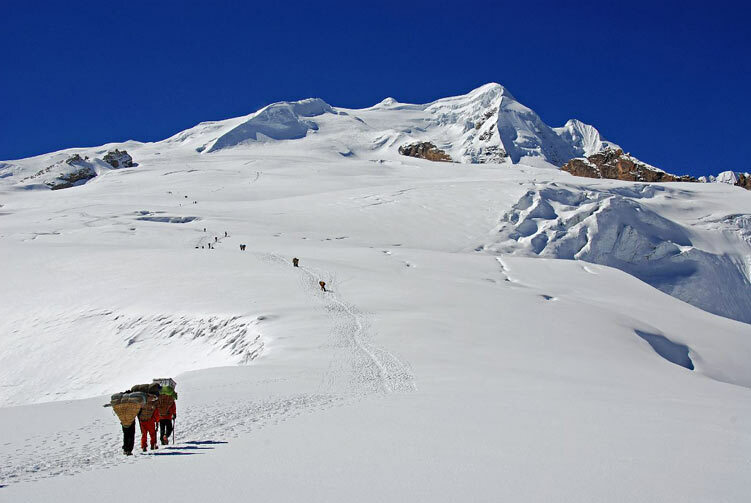 This big day crossing pass will take around 3 hours of climb to reach the Amphu Lapcha pass on the very first section. It�s a highly challenging technical climb to the pass on fixed line that is set up by our crew members. Once at the pass, we can enjoy a magnificent view of the towering Himalayan peaks. After spending a good time at the pass waiting for all the team members to arrive, we lower down on fixed rope carefully. We walk down the Imja Glacier set up our camp at the base. It�s long day full of adventure and beautiful experience of technical climbing, incredible view and walking on the glacial moraine. We start the trek early morning towards Chhukung after breakfast. Our destination today is Island Peak base camp. It is an uphill trek to Chhukung early in the morning. After a short break at Chhukung, we start trekking to the base camp for our overnight stay. We set up our tented camp to spend the night. 13 Nights Accommodation in Tented Camp while on trail. 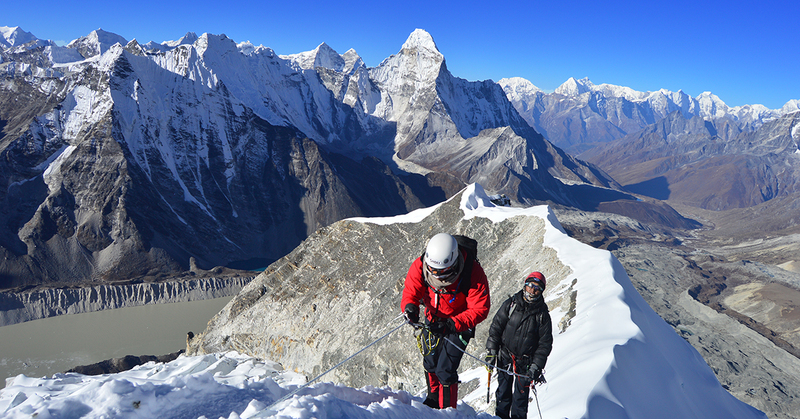 Island & Mera Peak Climbing permits and entrance fees for Everest National Park Area. 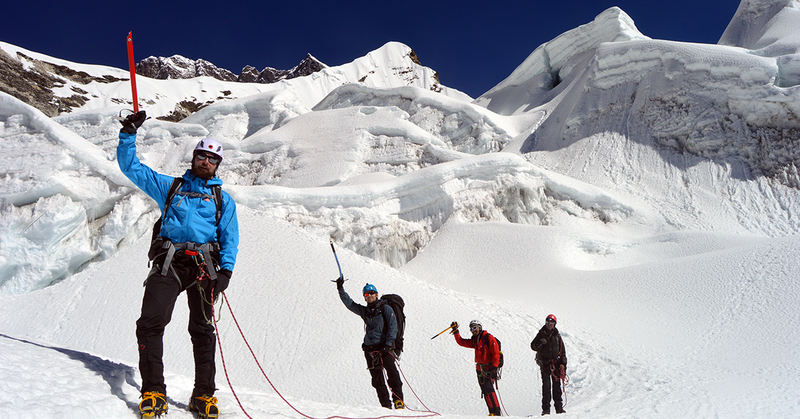 Island & Mera Peak group climbing gear, climbing rope, snow bars & carabineers etc. We offer you the best price guaranteed for Mera Peak/Island Peak Climbing via Everest Base Camp Trek Expedition.